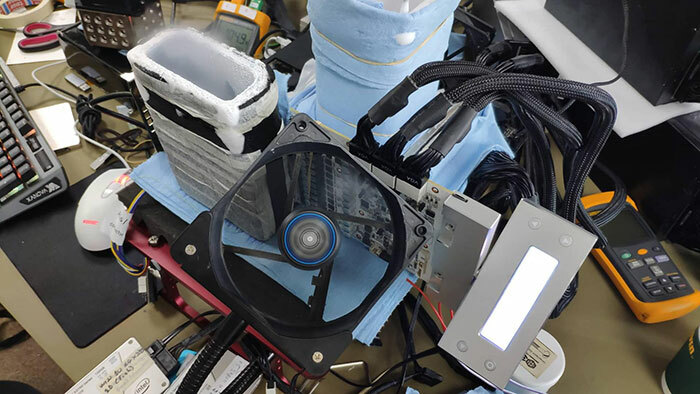 Overclocker OGS has overclocked a customised Nvidia GeForce RTX 2080 Ti to within a whisker of 3GHz. 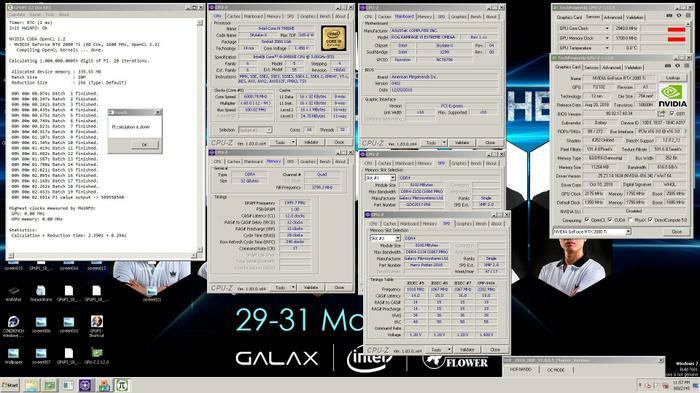 At the recent Galax OC Gathering 2019, the Greek overclocker managed to run a Galax GeForce RTX 2080 Ti Hall of Fame card at a clock speed of 2.94GHz. OGS then went on to gain the world record in the GPU PI benchmark (for an RTX 2080 Ti), and the world record in 3DMark Performance (for both a single GPU and for an RTX 2080 Ti). As you would expect, liquid nitrogen was used as the coolant for the GeForce RTX 2080 Ti to achieve the 2.94GHz in the GPU PI test. According to HWBot figures, this is a 118 per cent overclock. The GPU PI test score achieved with the overclocked system was 2.691s - that is how long it took to calculate Pi to the billionth place. You can see in the pictures within this article the tall LN2 pot, and other extreme OC paraphernalia that OGS used. The overclocker(s) are seen holding aloft the white PCB of the graphics card in other photos hosted by HWBot. For reference, the best ever performance in GPU PI is 2.559s - overclocker KingPin used an Nvidia Titan V graphics card to achieve this time/score. HEXUS previously reported on an LN2 overclock of an Nvidia GeForce RTX 2080 Ti reaching 2.415GHz, back in September last year. As mentioned in the intro, OGS managed to grasp another world record at the Galax OC Gathering 2019. A different PC system, but one still featuring a Galax GeForce RTX 2080 Ti Hall of Fame graphics card, managed to score 55081 in the single GPU 3DMark11 - Performance test. You can read more, and see the results on the HWBot website. As near as makes no difference to 3GHz on a GPU is insane! Especially when you consider the stock clock is 1350MHz. And yet still, it can't run Crysis. 3x8 pin power connectors… I wonder what the max board power is for that thing? It goes on about how many power phases it has and so on but keeps quiet on that. Maybe it's one of those things where “if you have to ask, you don't need it”. All very well but can it do the Kessel run in 5 parsecs. really can't decide which is more impressive, an RTX 2080ti @ ~3GHZ or a 16c/36t CPU at 6GHz.